Queensland Youth Week (3 - 14 April 2019) starts on Wednesday! 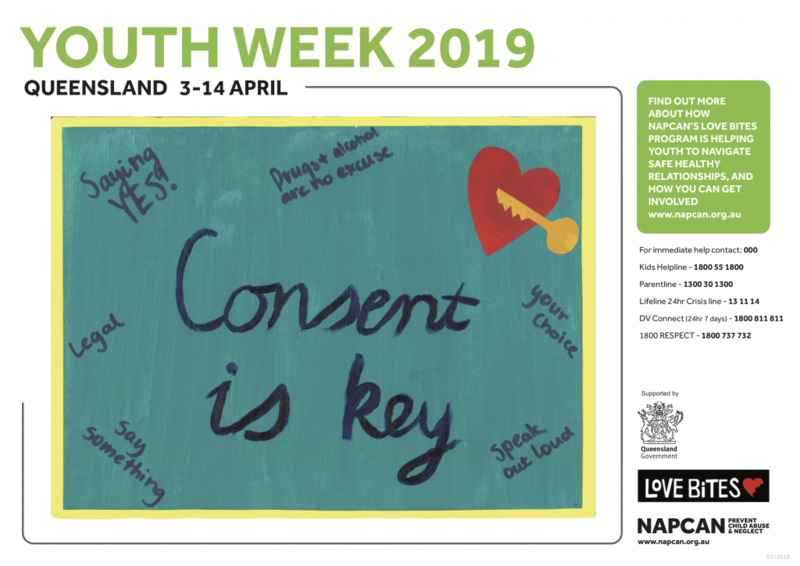 Queensland Youth Week (3 – 14 April 2019) starts on Wednesday! This year we are showcasing some of the fantastic artwork created by young people as part of the Love Bites Respectful Relationships program. We’re also providing a template for Love Bites communities to insert their own artwork as part of Youth Week to celebrate the positive contributions young people make to their communities and highlight the some of the important messages around respectful relationships. To insert your artwork, download the files above and open in ‘Adobe Acrobat’, click ‘edit PDF’ then ‘add image’ and drag into position and save. A Northern Territory specific poster and generic Youth Week template will also be made available by Friday 5 April.